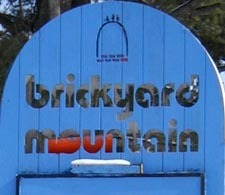 Brickyard Mountain was a small area that operated in Weirs Beach during the 1970s and early 1980s. The area had a vertical drop of 420ft, 1 chairlift and 1 rope tow, with the longest trail being 3000ft. According to Kevin Thomas, the chairlift was sold to Ski Ward, MA. Ken Norton: I went and checked out the Brickyard. It is for sale and quite overgrown. I skied around and eventually skied down a narrow trail to the bottom of the hill, basically to the boulevard at Weirs beach. Then I climbed back up the hill traversing and looking for any signs of a ski area. Right as I was leaving and out of time, I found two posts from the old lift. They are in the middle of dense brush and right at the edge of the property. It must have been just one open slope and can't be more than a 200' vertical. Dennis Holland: There was a place right outside of Weirs Beach on the way to Meredith called Brickyard Mtn., a hotel with its own small ski area. It was next to where the Kellarhaus gift shop/ice cream parlor is located. I stayed there in December of 1973 but don't remember if it was still operational then. Chuck Carmone: My first ski experience was at Brickyard Mt. (should have been called a hill) in Weirs Beach at the age of 7 (I'm 34 now). Mark Bodwell: My third bit of info refers to what I remember as a small ski area in the Weirs Beach/ Meredith area. It was called the Brickyard, I believe, and was on the Eastern slopes of a hill above Weirs Beach just off route 3 before Funspot. 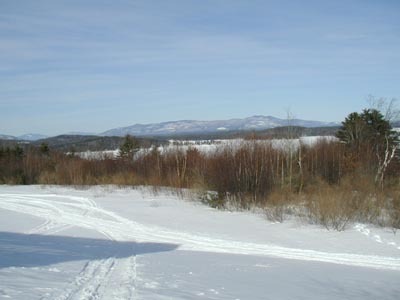 The slopes, at least 2, could be seen from in the Weirs Harbor, on Lake Winnipesaukee. The Brickyard was not far from the King's Grant Inn. A view of the rope tow tower, taken by Ken Norton. A view of Lake Winnipesaukee looking down the old slope. The rope tow is on the right. (Ken Norton) Mitchell Clure: Brickyard Mountain opened in the mid 70's and closed about 10 years later. My family did go skiing there in the early 80's. It was just up the road from Weirs Beach. They had night skiing. The hill offered an amazing view of Lake Winnipesaukee. They had one rope tow and one double chairlift. Brickyard Mountain was open to the public but it was also part of "Brickyard Mountain Inn". The inn still exists today although the ski area was closed some time in the 80's. Again, it was probably a victim of the lean snow years in the 80's. They did have pretty much 100% snow-making coverage because the hill did not have too many (maybe 6) runs. You can still see the garage (round building) that housed the snowcat and other equipment that was used for the operation of the ski area. The chairlift is gone. Apparently the Inn (renamed) is still open, and be found by visiting here. My wife and I were just up in this part of New Hampshire over the Labor Day 2001 weekend. We did not get a chance to go by Alpine Ridge but we did go by Brickyard. I wanted to walk/hike around Brickyard but we did not have the time and there is a fence around most of the property. The entrance sign (as pictured on your website) is still there (and is still damaged) and there is a "For Sale" sign on it. I don't know what they are trying to sell or how much it is. The chairlift appears to be gone and the mountain (the trails) are totally overgrown. FYI: Brickyard definitely had TWO lifts: a rope tow and a double chairlift. DGROHMAN: The area was in back of a large hotel (still standing just off of either rt. 3 or 25 or the Rt. 11 interconnect. Very close to a place called the "Fun Spot" and Weirs Beach. It overlooked Lake Winnipesaukee. 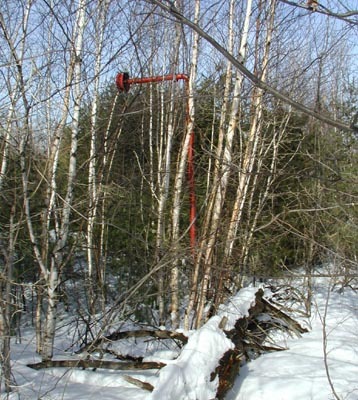 It is fairly grown in now, however, a short walk in allows you to see the remains of the red rope tow towers (or t-bar). I skied there once in the mid-70's or so on the way back from Gunstock. Small area, maybe 200 vertical feet with a few trails. A ski patch, from Jim Clarke. Pete LaFlamme: There was another resort-based ski area I can remember skiing at near Laconia, NH. The name of the hotel was originally the 'Shangri-La', but if was later known as the 'Brickyard Mountain Inn'. It was located on the east side of Route 3, just (~ 2 - 3 miles) north of Weirs Beach. The 'ski area' was located on a hill which dropped down toward Lake Winnipesaukee, a very pretty backdrop. However, the only times I remember skiing there was at night. They had night skiing on a couple of relatively short trails, with lights rigged up into the trees. I can remember large areas of shadows and darkness, and skiing with my crazy high school friends. I can't remember what they had for a lift! I suspect that it was a T-bar, I think I would have remembered a rope tow or a chair. I only skied there a few times, in the early to mid 70's. In traveling by in recent years, I have noticed that the hotel is now abandoned, with brush growing wild in front of the buildings. As the ski area was in the back, I don't have any update on its condition, but I suspect it is similar. Kyle Makulis: There is a hill called Brickyard Mountain overlooking the Weirs and Lake Winnipesaukee. A resort hotel called the Brickyard Mountain Resort was there until it burned sometime in the early 80's (in fact, the crew and cast of "Golden Pond" stayed there). I recall that they used to maintain a few trails (4 or 5) on the side of the hill facing the lake. I don't know if this is a figment of my imagination or not, but for some reason, I recall seeing trails on that hill overlooking the Weirs and Meredith Bay while x-country skiing on the lake one winter in the late 70's. Here's a view of the area in 1998. Notice that its growing in quite rapidly, and the proximity to Lake Winnipesaukee. Skip:I have some information that might be helpful with reference to Brickyard Mt. Ski Area Prior to around 1982 it was operated by the Brickyard Resort which was a hopping night spot in Laconia, N.H. Around l982-3, the Brickyard Corp., a Co. formed by a group of investors out of Garden City, N.Y. bought the whole complex for the purpose of selling condominiums. I know because I bought one. They advertise the ski area as part of the amenities but promptly closed it down, I believe in l983 -4, after all the condos were sold. The tower remained on top for a few more years and was an attraction for people hiking up the hill. The view was great. Sometime in the late 80's the corporation donated the ski hill to the state or county as a park and the new owners removed the tower - probably for liability reasons. One point of historical interest is that there is a road/driveway off of Rt. 3 leading to the top of the mountain. There used to be a cabin at the top of the mountain which, if memory serves me correctly, belonged to the man who lived there, very much by himself, before he died and it was developed into a ski area. I no longer have a trail map of the area but it had one major lift to the top and probably about a 450 - 500 vertical with a half dozen + trails to the bottom. Needless to say, not the type of area that could survive in the changing ski scene of the 1980's. Robert Ames: I grew up in Weirs Beach, NH. In my backyard I often explored the woods of Brickyard Mountain. Sometime in the 70's they built a ski area there. It was called the Brickyard Mountain ski area. They only had one chairlift. The placed closed only after maybe 1-3 years of operation. The lift was removed. I don't know the actual dates it was in existence. I never skied there. I was already a good skier (having learned at Gunstock) when they built it and to me it wasn't challenging enough to bother with. I was deeply disappointed when they built it because they ripped up my childhood playground. 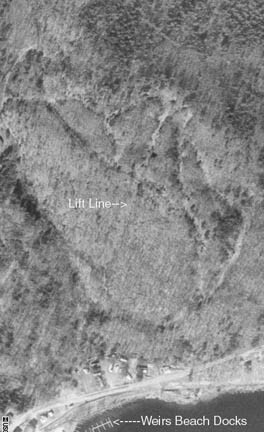 They totally destroyed the original glacial features, which included some huge boulders in a natural ravine and an interesting rock formation with what seemed like "Indian" steps carved into it. After the place closed, during the 80's, I used to walk up the access road to the top, where the old lift building remained for quite a few years, for an annual stargazing party during the August meteor showers. They finally destroyed the building about ten years ago. I haven't been up there since. Looking at the mountain today, you'd never know that a ski area was once there.